A magnificent performance was given by Ronald Ulen in the demanding title role. He had at his disposal the requisite "Ponderous" stature (that to be sure was assisted in the belly region) but over and above all was the appropriate vocal material. His splendid, attractive heroic baritone withstood the enormous demands of the role withour any sign of weariness, from thunderous fortes to the shispering falsettos. In the course of the role he by no means neglected the theatrical element. On the contrary, he showed himself to be extremely nimble and a versatile actor as demonstrated in the changes from the rough, strong blockhead to the charming seducer. He produced the evenings two distinct highpoints with the monologues "L´Onore and "Mondo ladro". 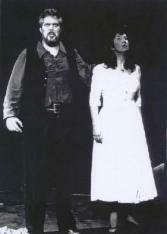 Highest regards are due to Ronald Ulen for his portrayal of Pizarro. He took his magnificent voice almost to the point of bursting, sometimes allowing the sheer vocal power of this villainous character to push the purer aspects of singing into the background. A thrilling performance. Vocally it was, with the exception of Ronald Ulens substantial Sharpless, a gloomy evening. Graf Almaviva feels sure of himself. The question is - how much longer? But Ronald Ulen commands the stage with the power of a bear and sings with the same dependability. Baritone Ronald Ulen gave a splendid performance as Don Medigua, infusing the part with considerable character, dominating the stage whenever he was present, and singing wonderfully throughout. As Zar Peter the First, Ronald Ulen was a congenial authoritarian manifestation, gifted with a magnificent heroic baritone voice. Ronald Ulen as Bluebeard showed himselb to be an accomplished actor to go along with an impressive vocal performance, through which he explored the entire range of expressions. He was convincing in the recitative passages with his excellent articulation and his adaptability to move between the delicate lyricism and the dramativ outbursts, not to mention the vocal range, was more than convincing. Ronald Ulen is an Almaviva with powrful physical presence as well as possessing an impressive, majestic voice. The Marcello from Ronald Ulen was a pleasure right from the very beginning. His powerful yet technically well aligned voice blended well with Colline and Schaunard. The tender hearted Forester of Ronald Ulen was by far the most demending and rewarding role among the "people" characters, which he impressively formed with his excellent and voluminous yet cultivated character baritone. The vocal performances of the evening were for the most part marvelous ... It was as if Verdi had written the role of Renato specifically for Ronald Ulen. No less convincing were the mens roles, in particular Ronald Ulen as the four villains as Mephisto figur with clubfoot - all the more threatening because he avioded any overplayed caricature. He impressed with sonorous sound in the Scintille Diamant Aria from Dapertutto and the demonic side of Dr. Mirakel showed him at his best acting. The role of the actor John Plake as portrayed by Ronald Ulen was defined by the sincerity of his larger than life mimic, all characteristic for someone such as Plake. He dominated the stage both physically and vocally whenever he appeared - an impressive perfomance.